Say hello to my sponsor... Lisa Leonard Designs. I have introduced Lisa Leonard's designs before, so some of you might be familiar with her, but I am happy to keep sharing about her again and again as Lisa continues to create and inspire with her meaningful and simplistic jewelry. Featured above are some of Lisa's newest creations that are now available in her shop, you must definitely check them out. Timeless and beautiful, everyone should own a little something (or a lot of somethings) from Lisa Leonard. For you, my dear friends, Lisa Leonard Designs is giving away a $50 gift certificate to one lucky reader. If I were to win, though that isn't possible, I would use my gift certificate to get this, maybe you would too! Now, there a few ways to enter and get yourself more chances to win this lovely giveaway. 1. Leave a comment on this post telling me about your favorite Lisa Leonard design. 2. Become a follower of Lisa's tweets on twitter and let me know that you have by leaving me another comment here. 3. Blog, tweet, or facebook about this giveaway and leave the link here. The giveaway will end at 8am PST on Wednesday, March 10th and don't forget to come back Thursday to this post as this is where the winner will be announced. Good luck! Thank you so much Lisa Leonard!!! Come back tomorrow as I introduce another lovely sponsor! Congratulations Erica!!! Please email me to claim your prize. Thank you to all who entered!!! i love all of her designs!! My favorite of LLD is the "Up From Here" Necklace. All of her necklaces/bracelets are SO beautiful! I ADORE the "fly free" necklace! such beautiful things! The Love Banner necklace is on my wishlist! i love the heartstring necklace or the sweetheart tree! i've been lusting after her designs for months now- i hope i win! 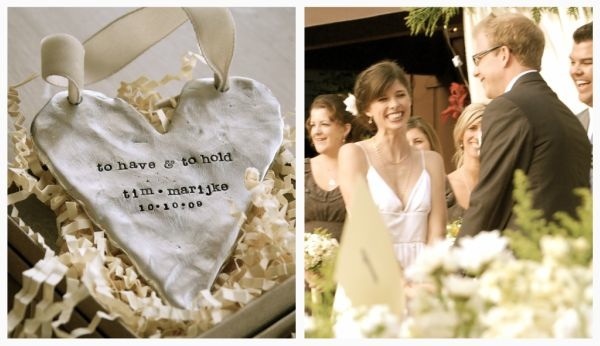 I love her pewter heart wall hanging =) So perfect for a wedding or home. I love the sparkle necklace, oh and the one with the bird on the top of her page, yea I like the fly free one toooo!! Sooo many, ssooo prettty!! Oh! I love all her designs, but there's going to be a new little baby in the family in 3 months and I just fell in love with the idea of a baby's first spoon! I love all her items but I think its between the thin sterling cuff, or maybe the sparkle necklace. How about one of everything! I love Lisa Leonard's necklaces! The Dewdrops Necklace is my current favorite! I love the flyfree necklace on her shop. Very pretty. I LOVE all her designs, but am in true love with the friendship necklace and the up from here necklace. Gorgeous designs! Oh my gosh... what pretties she creates! How do you choose? I think that my favorite (which will probably change in 20 minutes!) is the initial frames. I would want 3 to represent my three children... and coud easily be talked into my ones for my grandchildren as well if I win! Thanks so very much for the chance to win! I love the vintage frame necklaces. So pretty! Oh... I adore the "jumble of charms" necklace... Just so sweet! I just posted the giveaway on my blog! I would also love the sweetheart tree necklace. so sweet, so simple. I would choose the vintage frame necklace with the loop-de-loops, my initial, and a pearl. I love her creations & read her blog. Thanks for introducing this store - I have an uncredited picture on my pc of a ring that says 'Find Joy' - I think it must be one of her designs. I like the 'Fly Free' necklace - I would add the pendants to my charm necklace! I just found your blog and LOVE it!!! I LOVE Lisa's designs! I love her vintage frames necklaces and the custom name tag with pearl necklaces! I've been dying to get one for myself with my kiddo's names on them! Thanks for the chance to win! Right now, I'm really liking her baby spoons. I also really like the single word key chains. oh my you know I love giveaways! thanks for entering in mine...good luck. I just love her vintage frame necklaces. gorgeous! I love all of her pieces, but the Sea Star necklace is at the top of my wish list right now! Oh, that baby spoon! So nostalgic and modern too. I love its simplicity. But then I also love the sweet and simple birdie necklace. I need both! I love the sweetheart tree necklace! I would have a hard time deciding between that and the heartstrings necklace. I like the "lots of love" necklace. Gorgeous jewelry!! i would love the teenie tiny initials necklace for my teenie tiny tots! I love the teenie tiny initials necklace, it is so sweet! so pretty ! i would use the gift certificate to buy the be still necklace! I love all her designs but I think my favourite is 'from up here' and 'family tree'. I follow Lisa on twitter now! I don't normally do status updates on facebook, but I made an exception cos your blog and Lisa's jewellery are awesome! I'd get the thin sterling cuff. i'd have to choose between the pewter heart for my cousin's upcoming wedding or the key to my heart necklace. I'd also love the original circle pendant inscribed "love your guts" crossing my fingers. The Sweetheart Tree is my favorite, too, although I love the Vintage Frames, too! Her work is all so lovely, it's difficult to choose a favorite. For me it goes back and forth between the illuminate necklace and the paper lantern necklace. My favorite is the sweetheart tree necklace. :) LOVE it! I've looked at her site before and love the leather cuff bracelet! I'm lucky enough to already have a Lisa Leonard necklace. But as you say, a girl perhaps should own a lot of it! So beautiful. I love the 'from up here' necklace. man, i've been trying to win one of these necklaces forever! love em! my current LL fave is her petite family crest! As much as I would love something for myself, my husband would love one her leather cuffs for men. My hubby is about to become a father of our first baby and he has so much in store for him. He is amazing. and I also blogged about it ! the "key to my heart" necklace is just beautiful but I think I would love baby's first spoon for my little boy. I especially like the earrings: crystal drop and aqua stone to be specific. I'd love to win! Here's hoping! I love the custom banner necklace!!! I love the aqua stone earrings and the sweetheart tree necklace!! Beautiful! I love the heartstring necklace! I love the My Heart design but they are all so lovely, it is hard to pick just one favorite. I absolutely love the sweetheart tree necklace myself! All of her work is so beautiful. Thanks for the giveaway! i love her "Basic ID Tag"! I'd love to have one of those!!! so so hard to choose a favorite, but I love Sweet Daisy Cuff & I am crazy over "From Up Here" and the sentiments behind it! Love Lisa Leonard Designs! OK - now following Lisa on Twitter! I did a Facebook post and I blogged about the giveaway here! Thank you! I think I was supposed to do a separate comment for my Facebook post - so here it is! I posted the giveaway on Twitter! Thanks! I love the "you are loved necklace" so sweet and pretty! I've had my eye on the Banner necklace for a while now -- love it! I would love to win this giveaway! My sister-in-law would love a tiny squares necklace with her three kids' names on it, and her birthday is coming up! 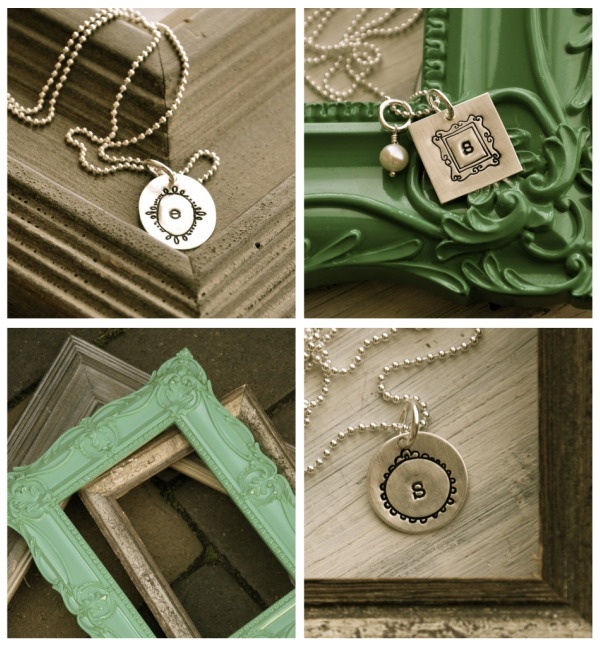 Love the teenie tiny initials necklace or the be still necklace. I was so excited to see that Lisa Leonard was a sponsor! I have been gushing over everything in her online store for weeks now, and saving to buy the Be Still necklace. I absolutely love it. I was already a follower on her blog, but thanks for the hookup on her twitter! closetoptimist tweeted @lisaleonard you make the world more beautiful! i heart the forever necklace... sweet and elegant.!! Hi - My favourite item would have to be the aqua stone earrings - so pretty! the baby spoons are just adorable. would make a great shower gift, too! I love everything in that shop! There is such a nice simplicity about every design. If I had to pick a favourite I'd go for the "fly free" necklace. Love everything - the vintage frames are gorgeous. LOVE the vintage frame necklaces - perfect for Mother's Day (I think ahead)! I'm such a fan of Lisa's! I absolutely love the "Love Banner necklace" and the Petite Family Crest necklace! My fav right now is the be still necklace. I love Lisa Leonards piece! Wow so many people have responded but I were to win I would choose either the Family Crest or the Sweetheart Tree necklace. So pretty! I love the family crest necklace. I love that is has two layers and the crest is so pretty. It would be perfect. My favorite for some time now has been the little birdie one. Still my favorite! I love the sweet and simple bird necklace. So pretty! I love those vintage frame necklaces! Especially as they have an 's' which is my initial... It's like they're begging me to wear them! i love the simple birdie necklace! i love love love the illuminate necklace. :) and your blog. i love your blog so much! Her "from up here" necklace is so gorgeous. Thanks for hosting such a great giveaway! oh my goodness! i, too, love the sweetheart tree necklace. so lovely!! 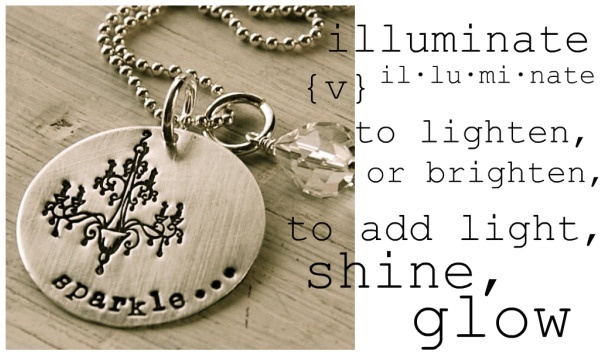 i love the illuminate neckalce!!! I'm so totally a huge fan of Lisa Leonard's designs! Her stuff is gorgeous! I want a little of everything! The vintage frames necklace is perfect! The banner necklace is oh so fun, thanks!! Ooh how lovely! I'm head over heels for the "sweetheart" tree necklace-too adorable! i love the be still necklace. so pretty. It is really, really hard to choose, but I think I would love the sterling ring with mine and my honey's names on it. That would be a nice replacement for my temporarily too-snug wedding ring post-baby! wow, everything is beautiful! i would love love love the petite family crest. so vintage/classy!! I like the dewdrops necklace. Lovely! I love everything, but my current favorite is the paper lantern necklace. I love the sweet and simple birdie necklace, plus about 20 other necklaces. Everything she makes turns out beautifully. I LOVE the sweetheart tree necklace - A-dorable! Captured Heart is my favorite!!!! Thanks for the link! I am following Lisa on Twitter now! hmmmm... I think I would choose the "fly Free" necklace, but its all great stuff.